(MARSHALL) – Three Longview companies are utilizing Texas State Technical College for training employees in new technical skills. Komatsu Mining Corp., Stemco and Westlake Chemical Corp. have scheduled training on-site and at TSTC’s Marshall campus in recent weeks. Thirteen employees at Stemco, which produces bearings, hubcaps, seals and other products for the heavy- and medium-duty trailer and truck industry, will take computer software classes at the end of March and a class in measurements and tools in April. The classes are conducted through a Texas Workforce Development grant. “We looked at the company needs and worked with TSTC to see what courses they had available and would work best with our colleagues,” said Amanda Tarbet, a human resources business partner at Stemco. About 140 Stemco employees have already completed five courses in leadership, manufacturing and other topics through TSTC in 2018 and 2019, Tarbet said. Tarbet credited Stemco’s plant manager William Leadaman as being instrumental in getting the training for employees. 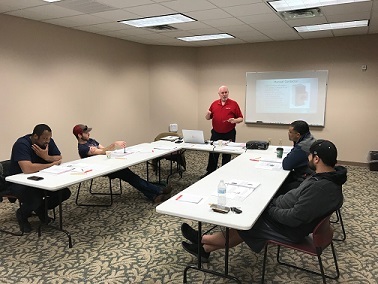 Four employees at Westlake Chemical recently took a three-day course in motor controls. Eight Komatsu employees are taking two inventory management classes this month at the company. This entry was posted in Marshall on March 15, 2019 by Daniel Perry.